Welcome to Kumulos - The Mobile App Performance Management (mAPM) Platform! Your Kumulos console provides a single-pane-of-glass to manage all of your clients and all of their apps. The feature set is tailor made for busy mobile app developers and development agencies. 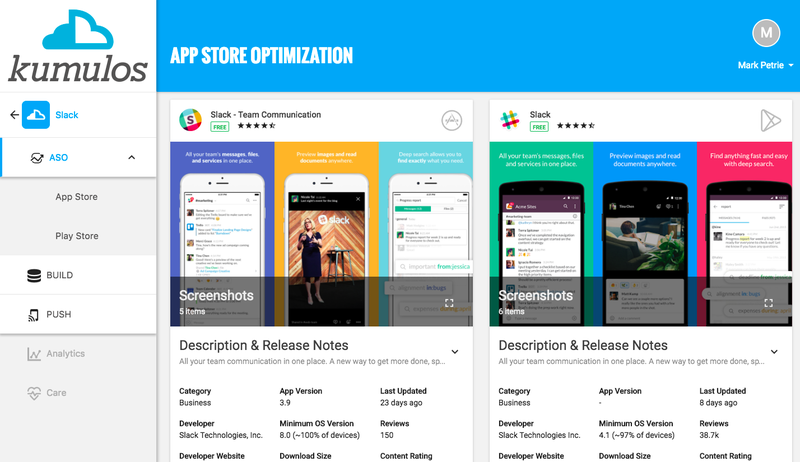 App Store Optimization lets you see how well your app is performing in the App Store and Play Store, including recent reviews and how your app ranks for certain keyword searches vs. competitive apps. Analytics collates all the data from ASO, Push and Diagnostics together with the usage of the app itself to give vital insights into the audience (who is using the app, where and on what device), retention (who is still active after 7 or 30 days), engagement (when is the app used and for how long) and conversion (through key user journeys) as well as how well the app is performing. All of this helps you make informed decisions on how to drive more downloads, increase retention and conversion. Reporting then lets you generate weekly and monthly reports summarizing who is using your app, how engaged they are with your app and how well the app is performing. Once enabled, you can run as many reports as needed, annotating and customizing the content if required prior to delivery to your client. You work hard to acquire users for your app, but they will have no hesitation uninstalling your app if it crashes, has bugs or is slow. Crash Reporting & Diagnostics gives you complete visibility of the technical performance of your app and all the services it depends on to function so you can pro-actively minimize the impact of any problems on your audience. Monitoring Checks alert you when there are problems with any of the API Endpoints that your app depends on to function, such as an endpoint being unreachable, returning the wrong response code, having a slow response time or returning a data payload with the incorrect shape. Crash Reporting alerts you when exceptions occur in your app, providing all of the information needed to pro-actively prioritize and fix issues before they negatively impact retention rates. App Build is our mobile Backend-as-a-Service (BaaS) feature to manage the content in your app via easy-to-use, SQL based data storage in the cloud and RPC API Methods to access and manipulate data from one of our many mobile SDKs (including Objective-C, Swift, Android, Cordova, Xamarin, React Native, Unity and more) or server-side, via REST, PHP or any HTTP Client. Running an agency? Great! Kumulos is the only platform for mobile app developers that will save you time and money during the app build and make you money once the app is launched. Invite your clients to login to their own client portal where they can view the analytics and reports for their app and you can share files and links with them. Rebrand your console, the client portal and reports with your own logo, colors and subdomain so it is your brand that your clients see when they login. Keep life simple with Kumulos - All of your clients, all of their apps, all in one place!